American Guinea Hogs are a critically rare breed of pig that is unique to North America. 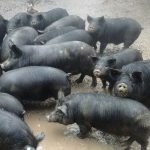 The original stock for the breed, over the last 200-300 years, developed through adaptation and crossbreeding with Appalachian English pigs to create an American original. They were commonly found on homesteads in the southeastern US. American Guinea Hogs, also known as Guinea Forest Hogs, are now found on small farms and large ranches throughout the United States. Guineas are one of the smaller breeds of pigs, ranging from 150 to 250 pounds at maturity, with a carcass of 50 to 100 pounds. 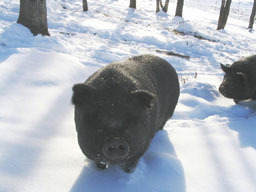 With a docile disposition, they make an excellent homestead pig, able to forage for much of their diet; which includes snakes, nuts, rodents, grass and roots. American Guinea hogs have upright ears, a hairy coat and curly tail. They are usually black, but occasionally a Guinea hog will have some reddish tinting, white socks, or even some white or gray on the body. 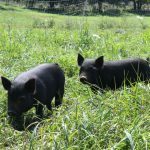 American Livestock Breeds Conservancy (ALBC) classifies Guinea Hogs as critical on the Conservation Priority List. 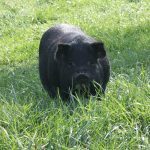 The American Guinea Hog Association was formed to preserve this rare breed for future generations of farmers and ranchers wanting a smaller pig to produce pork for the family on farmettes and homesteads. 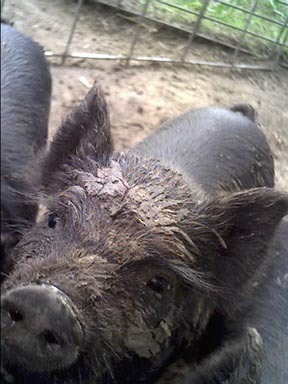 Visit our Breeders page to purchase American Guinea hogs for your farm or homestead. 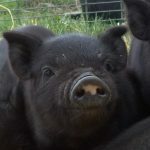 Join our discussion forum to learn more about this rare breed from farmers devoted to their preservation! 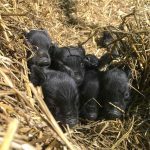 Are you a Guinea Hog breeder and would like to be listed on our Breeders page? Submit your Membership Application!